Cranky Fitness: Snickers and Kit-Kats and Twix - Oh My! The Cranky Fitness Early Warning System has been activated. It's that time of year again. This upcoming Halloween marks the kick-off of the High Holy Calorie Days that last into the New Year and it's only a couple of weeks away. Do you have your emergency candy evacuation plan established yet? Have you built your suar-free bunker in the back yard? How are you going to protect yourself? I know what you're going through - you run out to the store for some hummus and flax seed and your eye gets caught by the bright shiny bags of Halloween candy. And they're everywhere! They're multiplying like rabbits. Oh, and the candy comes in those cute little one- or two-bite sizes that can't really do any harm, right? That's an okay strategy if you were only buying them one at a time instead of a bag of fifty. Just like the way you buy potato chips, right? As if. Check out this nifty little candy/exercise calculator that helps you figure out how much work you'd need to do after ingesting just ONE harmless little "fun size" candy, which would require a 0.8 mile walk to burn of the 80 calories. A slice of pumpkin pie? 2.8 miles. Resisting temptation? Priceless. The potential for disaster here is higher than Jimi Hendrix at Woodstock. Preparation is always our best defense in a situation like bulk candy marketing. Have you got a plan? Unless you love the look and feel of cold dried egg all over your house and car and toilet paper-strung trees, you must have something on hand for the little darlings when they come to your door. But having all that candy in the house is so tempting. What's a responsible Treater/Cranky Fitness person to do? How about giving out fruit, you ask? Don't even think about it. For kids, that's like getting clothes for a Christmas gift not to mention their parents ramping up into flip-out mode over something unpackaged or homemade (so much for my strategy to unload last Christmas's fruitcake). So unless you plan on having your attorney handing out the apples and homemade goodies with waivers and disclaimers attached, it's good to have a Plan B.
I've always had pretty good luck with buying candy I don't like (which isn't a lot) so I'm not tempted to sample the wares and actually wind up without any treats when the big day arrives - only to then have to run out to the store and buy more. Having candy around me in an unsupervised environment has always been dangerous to me. I remember raising money for my high school ski club years ago. The fund-raising idea was to sell those really big chocolate bars - plain, crispy or with almonds - for $2 each, only I ate my entire supply and funded it with my hard earned babysitting money. The good news was that I didn't "sell" the most. The bad news was the increased velocity at which I skied down the trails due to my greater mass (learning the immutable laws of physics the hard way - so I guess high school wasn't a complete waste of time). But there's a delicate balance to be struck here - you can't go with completely crappy candy that has the taste and consistency of antacids or else your house will be pelted anyway. Ask a kid if you're not sure. Be careful to avoid another common pitfall and that's your distribution system. The "one for you, two for me" model is going to get you in trouble. Some folks actually leave the bowl of candy outside for the kids to help themselves to. Good idea - assuming that only well-mannered toddlers and their hovering parents come calling. 'Tweens and other assorted trouble makers can clean you out. Money? Travelers checks? Why the heck not? Cash is the universal people-pleaser but perhaps not feasible if you get a lot of Trick or Treaters. Also, currency rates tend to fluctuate wildly and presently the dollar is quite weak versus the yen and the euro. Consult your investment advisor. Perhaps a stock option plan is called for. Hmmmm.....this is getting complicated. And expensive. Not to mention the additional temptation of raiding your kid's stash once his or her little head hits the pillow. Come on - you know you do it. Be more honest about it than claiming that the only TV you ever watch is PBS. Readily accessible free candy has that awesome power to turn even the likes of former Fed chairman Alan Greenspan into a prancing, preening Borat. The sugar may be refined but the behavior it inspires clearly is not. I'm going to make a Solomonic split decision here and opt for different outcomes depending on size and maturity level of the recipient. Kids, celebrities, members of Congress and reality TV show contestants all get to keep and eat their candy within a tolerance of plus or minus one metric ton per sitting. Responsible adults aged 35 and over - bring the extra candy to work, cobble it into this year's Christmas fruitcake, or think of something else to do with it other than eat it. Don't get tricked into treating. Thanks for the tips to try and help me avoid falling into that calorific candy trap of halloween! I think Easter candy is better...PEEPS!!! and I am quite aware they have taken the "peeps" and made ghosts out of them for halloween, I don't care what anyone says, yellow chick peeps are the only ones that taste good. But yeah I don't know if I want to do all that much more exercise to get rid of it. every year I return to the candy. I always like the "give out candy you don't like yourself" advice... IN THEORY. But when I get to the store I see those little mini milkyway's and snickers and peanut butter cups it's all over. I have to get the kind I like. I do seem to be better than I used to be about keeping leftovers in the freezer for "must have treat" emergencies, rather than scarfing them all up at once. It's calorie calculations like the ones you mentioned that help me use a little restraint. If you don't mind being the crazy extremist in the bunch (and obviously I don't), you could just become a raw vegan and give up all processed food so you are not tempted anyway. Of course, I still have to hide the stuff from the rest of my family so that it doesn't disappear before the night in question. Any hidey hole suggestions? They have figured out all of my old ones. Our strategy is simple - we live in an apartment building with a locked external door. No trick or treaters = no candy. Sure, some people may think this is going overboard in an attempt to avoid the candy holiday, but really, it's just good planning. Unfortunately, that means leftover candy...... 'cause you have to buy some "just in case"..... sigh. I buy the stuff I like as I know there'll be leftovers. But this year I bought a smaller box of chocolate bars and will make the effort to give them all away. You had me laughing about the high school candy fund raiser. I too ate most of my stash...peanut butter cups. Thanks for confronting this topic. It's a heads-up for me to prepare some sort of strategy. 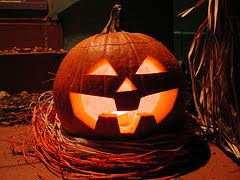 baffles me why halloween is such a big deal across the pond - here, not so much!!! Love halloween. All the costumes, and happy kids...awesome! The candy always made me happy, but I'm not as bad around it as other foods (fried is a weekness). Then again, I'm a freak of nature that doesn't like chocolate much and realize it's everyone else's crack, so I get the candy I don't care much for. Messymimi - my suggestion for where to hide the candy from my teen is where he's least likely to look for it - in the shower. Gina - when it's "for the children", how could anyone fault us? W&W - we have a saying here, "Go big or go home" and must apply it to just about everything that touches our lives - no matter how insignificant. I love Halloween! It kicks off the uber-holiday season. BUT! We live out in the boonies. So no trick-or-treaters. We pack up the kiddo and head to a friends house in town. They buy all the candy. We take turns: one year the boys take the kids while the girls stay home and hand out candy, next year vice versa. We're never home on Halloween, so I don't buy any candy to give out. A good idea is to buy some cheap toys from a place like Oriental Trading - you can get dozens of goodies like mini slinkies, sunglasses, yo-yos, etc, for pretty cheap, and they're a lot healthier for the kids! I am so glad it isn't such a big thing over here or I would be unable to get on my broomstick for all the sugar on my hips! Great article! We don't have kids but our neighborhood is crawling with them. I can't have Halloween candy in the house, so color me curmudgeonly, I'm not buying it. I'm going to stand in the doorway and shout "GET OFF MY LAWN!" I kid. We're making that Saturday a "date night" so we won't be here wishing for a bucket of mini-Mounds. I'd much rather save my calories for Thanksgiving dinner and Christmas cookies. Loved this post! I thoroughly enjoy your writing style. For me I don't need to stock candy for trick or treaters cause I live on a college campus for work. I'm the one that regulates that New Years eve every night thing LOL. Anyway good luck to you all in resisting the temptation of eating all that candy. Andra - I think we may have been separated at birth as I've been known to shout kids off my lawn too. Cert.Fit - dealing with college kids every night? You have my undying admiration. I never thought I would say this, but I think I'm actually going to be thankful that I'm prediabetic over this Halloween -- I CAN'T eat any of the candy we'll be handing out. So no danger of that while it's sitting in the pantry before the trick-or-treaters arrive. And I'm sending the leftovers to my husband's office the next day. Plenty of folks there who will dispose of it for us. Our strategy is pretty easy. We live on a really steep hill. And by Halloween, it is usually COLD OUT! Sometimes raining. Most kids just don't bother trekking up this way. So we keep our porch light off and no candy in the house. Which sounds sort of Scrooge-like. I actually like Halloween and our first couple years here, did the whole candy bit. Only to find that we had maybe as many as five trick or treaters? Even though I gave out HUGE handfuls of candy (Talk about big eyed kids!) we were still left with a lot at the end of the evening. Which ended up down the hatch. Mostly my hatch, hubby is diabetic and knows better. Just not worth the effort or the temptation. Christmas is my booby trap. I just love the look of candy canes hung on the tree. Unfortunately, I also love the taste of peppermint candy canes rather equally well. Have never gotten the fascination with PEEPS. Most Easter candy is just gross. Except the PB egg. Give me the Reese's Peanut Butter Egg every damn time! I try to keep it to only one or two for Easter tho. Halloween is always tough for us fitness crazies but like some said on my blog, they like the kids to enjoy a couple times a year as long as it is not every day. BUT, I agree, things like sugar free gum, little toys & stickers that they have big bags of now can be a great substitute. I tend to be the type that buys candy I don't like OR for me, just ain't worth the extra calories & workouts & would keep me from the real treats I like to eat. It is planning & a mindset for me.... nothing too tempting & my thoughts of my beloved cookies that I love to treat myself with each weekend! I'm with moonlight dancer! Halloween candy really isn't my weakness (candy corn? Blech!) but Easter now... Mmmmm... Wait - we're supposed to be talking about how NOT to eat candy right? My only "trick" is to not buy any until the day of. Not only is it usually marked down but also only the nasty stuff is left! We have a really easy way to avoid post Halloween candy bingefests: we volunteer at the local marathon, conveniently timed just after Halloween, and hand out all the baby Snickers to unbelievably grateful shufflers at mile 21! It's just the weeks BEFORE Halloween that are dangerous around here.